As of 2008, AC/DC have sold more than 200 million albums worldwide, including 71 million albums in the United States. Back in Black has sold an estimated 45 million units worldwide, making it the highest-selling album by any band and the 2nd highest-selling album in history, only behind Michael Jackson's Thriller. The album has sold 22 million in the US alone, where it is the fifth-highest-selling album. AC/DC ranked fourth on VH1's list of the "100 Greatest Artists of Hard Rock" and was named the seventh "Greatest Heavy Metal Band of All Time" by MTV. In 2004, the band was ranked number 72 in the Rolling Stone list of the "100 Greatest Artists of All Time". Brothers Malcolm, Angus and George Young were born in Glasgow , Scotland, and moved to Sydney with most of their family in 1963. George was the first to learn to play the guitar. He became a member of the Easybeats, one of Australia's most successful bands of the 1960s. In 1966, they became the first local rock act to have an international hit, with the song "Friday on My Mind". Malcolm followed in George's footsteps by playing with a Newcastle, New South Wales , band called the Velvet Underground (not to be confused with the New York–based Velvet Underground). Malcolm and Angus Young developed the idea for the band's name after their older sister saw the initials "AC/DC" on a sewing machine. "AC/DC" is an abbreviation for "alternating current/direct current". The brothers felt that this name symbolised the band's raw energy, power-driven performances, and a love for their music. "AC/DC" is pronounced one letter at a time, though the band is popularly known as "Acca Dacca" in Australia and New Zealand. In November 1973 Malcolm and Angus Young formed AC/DC and recruited bassist Larry Van Kriedt, vocalist Dave Evans, and Colin Burgess, ex-Masters Apprentices drummer. The band played their first gig at a club named Chequers in Sydney on New Year's Eve, 1973. They were later signed to the EMI-distributed Albert Productions label for Australia and New Zealand. The early line-up of the band changed often; Colin Burgess was the first member fired, and several bassists and drummers passed through the band during the next year. By this time, Angus Young had adopted his characteristic school-uniform stage outfit. The idea was his sister Margaret's. Angus had tried other costumes, such as Spider-Man, Zorro, a gorilla, and a parody of Superman, named Super-Ang. In fact in its early days, most members of the band dressed in some form of glam or satin outfit but this approach was abandoned when it was discovered Melbourne band Skyhooks had already adopted this approach to their stage presentation. The Young brothers decided that Evans was not a suitable frontman for the group, because they felt he was more of a glam rocker like Gary Glitter. On stage, Evans was occasionally replaced by the band's first manager, Dennis Laughlin, who was the original lead singer with Sherbet prior to Daryl Braithwaite joining the band. Evans did not get along with Laughlin, which also contributed to the band's ill feeling toward Evans. In September 1974 Ronald Belford "Bon" Scott, an experienced vocalist and friend of George Young, replaced Dave Evans. Like the Young brothers, Scott had been born in Scotland before emigrating to Australia in his childhood. The band had recorded only one single with Evans, "Can I Sit Next to You, Girl" / "Rockin' in the Parlour"; eventually, the song was re-recorded with Bon Scott as "Can I Sit Next to You Girl" (Track 7 on the Australian album T.N.T., and Track 6 on the international release of High Voltage). By January 1975, the Australia-only album High Voltage had been recorded. It took only ten days and was based on instrumental songs written by the Young brothers, with lyrics added by Scott. Within a few months, the band's line-up had stabilised, featuring Scott, the Young brothers, bassist Mark Evans and drummer Phil Rudd. Later that year they released the single "It's a Long Way to the Top ", which became their perennial rock anthem. It was included on their second album, T.N.T., which was also released only in Australia and New Zealand. The album featured another classic song, "High Voltage". Between 1974 and 1977, aided by regular appearances on Molly Meldrum's Countdown, the ABC ’s nationally broadcast pop-music television show, AC/DC became one of the most popular and successful acts in Australia. Their performance on 3 April 1977 was their last live TV appearance for more than 20 years. In 1976, the band signed an international deal with Atlantic Records and toured extensively throughout Europe. They gained invaluable experience of the stadium circuit, supporting leading hard rock acts such as Black Sabbath, Aerosmith, Kiss, Styx and Blue Öyster Cult, and co-headlined with Cheap Trick. The first AC/DC album to gain worldwide distribution was a 1976 compilation of tracks taken from the High Voltage and T.N.T. LP. Also titled High Voltage, and released on the Atlantic Records label, the album sold three million copies worldwide, partly because of its popularity with a British punk audience. The track selection was heavily weighted toward the more recent T.N.T., and included only two songs from their first LP. The band's next album, Dirty Deeds Done Dirt Cheap, was released in the same year in both Australian and international versions, like its predecessor. Track listings varied worldwide, and the international version of the album also featured "Rocker" from T.N.T. The original Australian version included "Jailbreak" (now more readily available on the 1984 compilation EP '74 Jailbreak or as a live version on the 1992 Live album). Dirty Deeds was not released in the US until 1981, by which time the band were at the peak of their popularity. Following the 1977 recording Let There Be Rock, bassist Mark Evans was sacked because of personal differences with Angus Young. 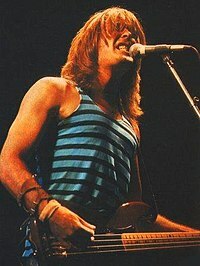 He was replaced by Cliff Williams, who also provided backing vocals alongside Malcolm Young. Neither of the Young brothers has elaborated on the departure of Evans, though Richard Griffiths, the CEO of Epic Records and a booking agent for AC/DC in the mid-1970s, later commented, "You knew Mark wasn't going to last, he was just too much of a nice guy." AC/DC were a formative influence on New Wave of British Heavy Metal bands who emerged in the late 1970s, such as Saxon and Iron Maiden, in part as a reaction to the decline of traditional early 1970s heavy metal bands. In 2007, critics noted that AC/DC, along with Thin Lizzy, UFO, Scorpions and Judas Priest, were among "the second generation of rising stars ready to step into the breach as the old guard waned." AC/DC's first American exposure was through the Michigan radio station AM 600 WTAC in 1977. The station's manager, Peter C. Cavanaugh, booked the band to play at Flint 's Capitol Theater. The supporting act was MC5, who had just briefly reunited and agreed to play at the event. The band opened with their popular song "Live Wire" and closed with "It's a Long Way to the Top (If You Wanna Rock 'n' Roll)". AC/DC came to be identified with the punk rock movement by the British press. Their reputation, however, managed to survive the punk upheavals of the late 1970s, and they maintained a cult following in the UK throughout this time. Angus Young gained notoriety for mooning the audience during live performances. The 1978 release of Powerage marked the debut of bassist Cliff Williams, and with its harder riffs, followed the blueprint set by Let There Be Rock. Only one single was released for Powerage, "Rock 'n' Roll Damnation" and gave AC/DC the highest mark at the time, reaching #24. An appearance at the Apollo Theatre in Glasgow during the Powerage tour was recorded and released as If You Want Blood You've Got It, featuring such songs as "Whole Lotta Rosie", "Problem Child", and "Let There Be Rock", as well as lesser-known album tracks like "Riff Raff". The album was the last produced by Harry Vanda and George Young with Bon Scott on vocals and is claimed to be AC/DC's most under-rated album. The major breakthrough in the band's career came in their collaboration with producer "Mutt" Lange on a sixth album Highway to Hell, released in 1979. It became the first AC/DC LP to break into the US top 100, eventually reaching #17, and it propelled AC/DC into the top ranks of hard rock acts. Highway to Hell had lyrics that shifted away from flippant and comical toward more central rock themes, putting increased emphasis on backing vocals but still featured AC/DC's signature sound: loud, simple, pounding riffs and grooving backbeats. The final track, "Night Prowler", has two breaths in quick succession at the start of the song, intended to create a tone of fear and loathing. On 19 February 1980, Bon Scott passed out after a night of heavy drinking in London and was left in a car owned by an acquaintance named Alistair Kinnear. The following morning, Kinnear rushed him to King's College Hospital in Camberwell, where Scott was pronounced dead on arrival. Pulmonary aspiration of vomit was the cause of Scott's death, and the official cause was listed as "acute alcohol poisoning" and "death by misadventure". Scott's family buried him in Fremantle, Western Australia , the area to which they had emigrated when he was a boy. Inconsistencies in the official accounts of Scott's death have been cited in conspiracy theories, which suggest that Scott died of a heroin overdose, or was killed by exhaust fumes redirected into the car, or that Kinnear did not exist. Additionally, Scott was asthmatic, and the temperature was below freezing on the morning of his death. Following Scott's death, the band briefly considered quitting; they eventually concluded, however, that Scott would have wanted AC/DC to continue, and various candidates were considered for his replacement, including Buzz Shearman, ex-Moxy member, who was not able to join because of voice problems, and ex-Back Street Crawler vocalist Terry Slesser, who turned down this opportunity when he decided not to join an established band and instead started a solo career. The remaining AC/DC members finally decided on ex-Geordie singer Brian Johnson. Angus Young later recalled, "I remember Bon playing me Little Richard, and then telling me the story of when he saw Brian singing." He says about that night, "There's this guy up there screaming at the top of his lungs and then the next thing you know he hits the deck. He's on the floor, rolling around and screaming. I thought it was great, and then to top it off—you couldn't get a better encore—they came in and wheeled the guy off!" Later that night, Johnson would be diagnosed with appendicitis, which was the cause of his writhing around on stage. For the audition, Johnson sang "Whole Lotta Rosie" from Let There Be Rock and Ike & Tina Turner's "Nutbush City Limits". He was hired a few days after the audition. With Brian Johnson the band completed the songwriting that they had begun with Bon Scott for the album Back in Black. Recording took place at Compass Point Studios in the Bahamas a few months after Scott's death. Back in Black, produced by Mutt Lange and recorded by Tony Platt, became their biggest-selling album and a hard-rock landmark; hits include "Hells Bells", "You Shook Me All Night Long", and the title track. The album was certified platinum three months after its release, and by 2007 it had sold more than 22 million copies in the United States, making it the fourth-highest-selling album ever in the US. The album reached #1 in the UK and #4 in the US, where it spent 131 weeks on the Billboard 200 album chart. The follow-up album, 1981's For Those About to Rock We Salute You, also sold well and was positively received by critics. The album featured two of the band's most popular singles: "Let's Get It Up" and the title track, "For Those About to Rock", which reached #13 and #15 in the UK, respectively. The band split with Lange for their self-produced 1983 album, Flick of the Switch, in an effort to recover the rawness and simplicity of their early albums. Amid rumours of alcoholism and drug-induced paranoia, drummer Phil Rudd's friendship with Malcolm Young deteriorated and, after a long period of unfriendliness, the men's dislike for each other grew so strong that they fought. Rudd was fired two hours after the fight. Session drummer B.J. Wilson was drafted in to help complete the recordings, but his drum parts were eventually not used. Although Rudd had finished the drum tracks for their next album, he was replaced by Simon Wright in the summer of 1983 after the band held an anonymous audition. Later in the year, AC/DC released the self-produced album Flick of the Switch, which was less successful than their previous albums, and was considered underdeveloped and unmemorable. One critic stated that the band "had made the same album nine times". AC/DC was voted the eighth-biggest disappointment of the year in the 1984 Kerrang! readers' poll. However, Flick of the Switch eventually reached #4 on the UK charts, and AC/DC had minor success with the singles "Nervous Shakedown" and "Flick of the Switch". Fly on the Wall, produced by the Young brothers in 1985, was also regarded as uninspired and directionless. A music concept video of the same name featured the band at a bar, playing five of the album's ten songs. In 1986, the group returned to the charts with the made-for-radio "Who Made Who". The album Who Made Who was the soundtrack to Stephen King's film Maximum Overdrive, and is the closest the band has come to releasing a "greatest hits" collection, which AC/DC have always refused to do. It brought together older hits, such as "You Shook Me All Night Long" and "Ride On", with newer songs such as title track "Who Made Who", and two new instrumentals, "D.T." and "Chase the Ace". In February 1988, AC/DC were inducted into the Australian Recording Industry Association's Hall of Fame. AC/DC's 1988 album, Blow Up Your Video, was recorded at Studio Miraval in Le Val , France, and reunited the band with their original producers, Harry Vanda and George Young. The group recorded nineteen songs, choosing ten for the final release; though the album was later criticised for containing excessive "filler", it was a commercial success. Blow Up Your Video sold more copies than the previous two studio releases combined, reaching #2 on the UK charts—AC/DC's highest position since "Back in Black" in 1980. The album featured the UK top-twenty single "Heatseeker" and popular songs such as "That's the Way I Wanna Rock and Roll". The Blow Up Your Video World Tour began in February 1988, in Perth , Australia. That April, following live appearances across Europe, Malcolm Young announced that he was taking time off from touring, principally to begin recovery from his alcoholism. Another member of the Young family, Stevie Young, temporarily took Malcolm's place. Following the tour, Wright left the group to work on the upcoming Dio album Lock Up the Wolves, and was replaced by session veteran Chris Slade. Johnson was unavailable for several months while finalising his divorce, so the Young brothers wrote all the songs for the next album, a practice they continued for all subsequent releases through Black Ice in 2008. The new album, The Razors Edge, was recorded in Vancouver, Canada, and produced by Bruce Fairbairn, who had previously worked with Aerosmith and Bon Jovi. Released in 1990, it was a major comeback for the band, and included the hits "Thunderstruck" and "Are You Ready", which reached #5 and #16 respectively on Billboard's Mainstream Rock Tracks Chart, and "Moneytalks", which peaked at #23 on the Billboard Hot 100. The album went multi-platinum and reached the US top ten. Several shows on the Razors Edge tour were recorded for the 1992 live album, titled Live. Live was produced by Fairbairn, and is considered one of the best live albums of the 1990s. A year later, AC/DC recorded "Big Gun" for the soundtrack of the Arnold Schwarzenegger movie Last Action Hero, and was released as a single, reaching #1 on the US Mainstream Rock chart, the band's first #1 single on that chart. In 1994, Angus and Malcolm invited Rudd to several jam sessions. He was eventually rehired to replace Slade, whose amicable departure arose in part because of the band's strong desire to again work with Rudd. In 1995, with the 1980–83 line-up back together, the group released Ballbreaker, recorded at the Ocean Way Studios in Los Angeles, California , and produced by Rick Rubin. The first single from the album was "Hard as a Rock". Two more singles were released from the album: "Hail Caesar" and "Cover You in Oil". In 1997, a box set named Bonfire was released. It contained four albums; a remastered version of Back in Black; Volts (a disc with alternate takes, outtakes, and stray live cuts) and two live albums, Live from the Atlantic Studios and Let There Be Rock: The Movie. Live from the Atlantic Studios was recorded on 7 December 1977 at the Atlantic Studios in New York. Let There Be Rock: The Movie was a double album recorded in 1979 at the Pavillon de Paris and was the soundtrack of a motion picture, AC/DC: Let There Be Rock. The US version of the box set included a colour booklet, a two-sided poster, a sticker, a temporary tattoo, a keychain bottle opener, and a guitar pick. In 2000, the band released Stiff Upper Lip, produced by brother George Young at the Warehouse Studio, again in Vancouver. The album was better received by critics than Ballbreaker but was considered lacking in new ideas. The Australian release included a bonus disc with three promotional videos and several live performances recorded in Madrid, Spain in 1996. Stiff Upper Lip reached #1 in five countries, including Argentina and Germany; #2 in three countries, Spain, France and Switzerland; #3 in Australia; #5 in Canada and Portugal; and #7 in Norway, the US and Hungary. The first single, "Stiff Upper Lip", remained at #1 on the US Mainstream Rock charts for four weeks. The other singles released also did very well; "Satellite Blues" and "Safe in New York City" reached #7 and #31 on Billboard's Mainstream Rock Tracks, respectively. In 2002, AC/DC signed a long-term, multi-album deal with Sony Music, who went on to release a series of remastered albums as part of their AC/DC remasters series. Each release contained an expanded booklet featuring rare photographs, memorabilia, and notes. In 2003, the entire back-catalogue (except Ballbreaker and Stiff Upper Lip) was remastered and re-released. Ballbreaker was eventually re-released in October 2005; Stiff Upper Lip was later re-released in April 2007. On 16 October 2007, Columbia Records released a double and triple DVD titled Plug Me In. The set consists of five and seven hours of rare footage, and even a recording of AC/DC at a high school performing "School Days", "T.N.T. ", "She's Got Balls", and "It's a Long Way to the Top ". As with Family Jewels, disc one contains rare shows of the band with Bon Scott, and disc two is about the Brian Johnson era. The collector's edition contains an extra DVD with 21 more rare performances of both Scott and Johnson and more interviews. AC/DC made their video game debut on Rock Band 2, with "Let There Be Rock" included as a playable track. The setlist from their Live at Donington live album was released as playable songs for the Rock Band series by means of a Wal-Mart -exclusive retail disc titled AC/DC Live: Rock Band Track Pack. No Bull: The Directors Cut, a newly edited, comprehensive Blu-Ray and DVD of the band's July 1996 Plaza De Toros de las Ventas concert in Madrid , Spain, was released on 9 September 2008. On 18 August 2008, Columbia Records announced the 18 October Australian release, and 20 October worldwide release, of the studio album Black Ice. The 15-track album was the band's first studio release in eight years, and was produced by Brendan O'Brien. Like Stiff Upper Lip, it was recorded at The Warehouse Studio in Vancouver, British Columbia. Black Ice was sold in the US exclusively at Wal-Mart and Sam's Club and the band's official website. "Rock 'n' Roll Train", the album's first single, was released to radio on 28 August. On 15 August, AC/DC recorded a video for a song from the new album in London with a special selection of fans getting the chance to be in the video.Black Ice made history debuting at #1 on album charts in 29 countries and alsohas the distinction of being Columbia Records' biggest debut album (sinceNielsen SoundScan began tracking sales data for Billboard in March of 1991).Black Ice has been certified Multi Platinum in eight countries, including theUS, Australia, Canada, Switzerland, Sweden, Norway, Germany and the CzechRepublic. Additionally Black Ice has achieved Platinum status in twelvecountries (Austria, Belgium, Denmark, Finland, France, Hungary, Ireland,Italy, UK, Argentina, Singapore and New Zealand) and Gold status in fourcountries (Netherland, Spain, Poland and Brazil). With over 6.5 millioncopies of Black Ice shipped worldwide, combined with over 5.5 million incatalog sold, AC/DC have surpassed The Beatles as the #1 sellingcatalog artist in the US for 2008. The 18-month Black Ice World Tour supporting the new album was announced on September 11 and began on 28 October in Wilkes-Barre, Pennsylvania . They band played 42 dates in North America, ending in Nashville , Tennessee on 31 January 2009. The Answer was the opening act during the North American portion of the tour. In late September 2009, the band rescheduled six shows when Brian Johnson underwent an operation for ulcers. On September 29, the band announced a collection of studio and live rarities, Backtracks, which was released on November 10, 2009 as a 3-CD/2-DVD/1-LP box-set. On the 4th November AC/DC were announced as the Business Review Weekly top Australian earner (entertainment) for 2009 with earnings of $105 million. This displaced The Wiggles from the number one spot for the first time in four years. AC/DC were inducted into the Rock and Roll Hall of Fame in March 2003. During the ceremony the band performed "Highway to Hell" and "You Shook Me All Night Long", with guest vocals provided by host Steven Tyler of Aerosmith. He described the band's power chords as "the thunder from down under that gives you the second-most-powerful surge that can flow through your body." During the acceptance speech, Brian Johnson quoted their 1977 song "Let There Be Rock". In May 2003, Malcolm Young accepted a Ted Albert Award for Outstanding Service to Australian Music at the 2003 Music Winners Awards, during which he paid special tribute to Bon Scott. On 1 October 2004, a central Melbourne thoroughfare, Corporation Lane, was renamed ACDC Lane in honour of the band. However, the City of Melbourne forbade the use of the slash character in street names, so the four letters were combined. The lane is near Swanston Street where, on the back of a truck, the band recorded their video for the 1975 hit "It's a Long Way to the Top ". Additionally, a street in Leganés (Comunidad de Madrid – Spain) was named "Calle de AC/DC" on 2 March 2000. Since Nielsen SoundScan began to track music sales in 1991, AC/DC have sold over $26.4? million worth of albums, making their sales figures second only to The Beatles, outselling both The Rolling Stones and The Who. Over the last five years, as CD sales have declined in general, AC/DC albums have sold just as well or better. They sold over 1.3 million CDs in the US during 2007 despite not having released a new album since 2001 at that point. In 2009 the Recording Industry Association of America upgraded the group's US sales figures from 69 million to 71 million, making AC/DC the fifth-best-selling band in US history and the ninth-best-selling artist, selling more albums than Madonna, Mariah Carey and Michael Jackson. The RIAA also certified Back in Black as double Diamond (20 million) in US sales, and by 2007 the album had sold 22 million copies, which moved it into fifth place.